Calling all artists from the Central Texas Area! If you are a singer, rapper, musician etc etc and is looking for a spot to perform; look no further! 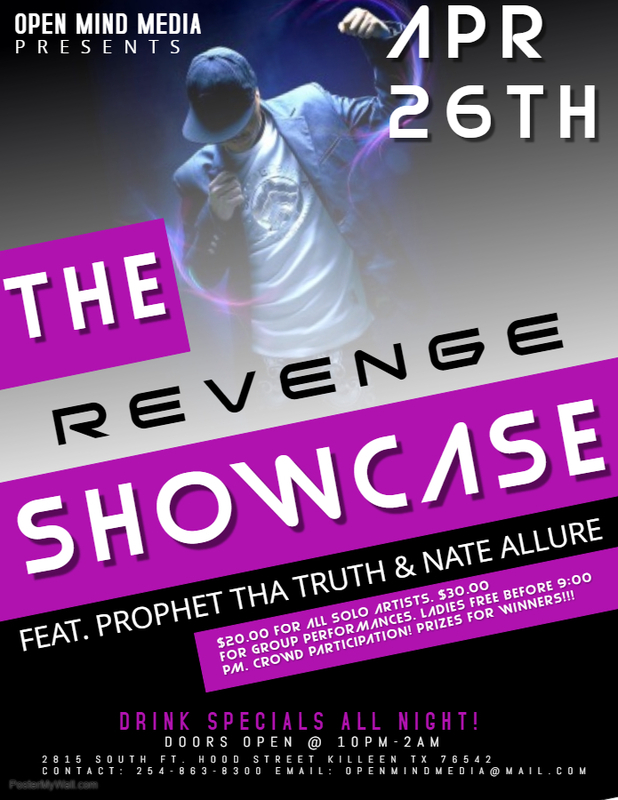 The Revenge Artist Showcase is your spot to broadcast your musical talents. Come out and support all of the local artist that are looking to show all of their talents on one main stage! Mass participation chooses winner and winner is subject to grand prize and a distribution deal with Open Mind Media LLC! Come out and network with Open Mind Media's very own Prophet Tha Truth and Nate Allure. Drink specials all night! Ladies free before 9:00pm! Please leave all egos home! We are about peace love and happiness and bringing our Central Texas Artists together! Artist check in is at 7:30pm.